Dear friends welcome back! 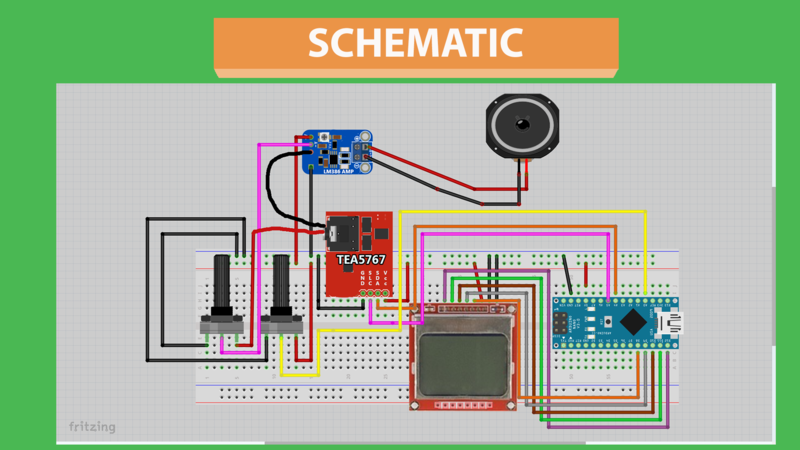 In this tutorial, we are going to build a simple FM Radio receiver on a breadboard. Please watch the attached video to listen to it for a few seconds. As you can see the radio is working fine and we can hear some music coming out of it. I am transmitting some YouTube safe tracks using this inexpensive FM transmitter at this frequency. I am using the Nokia 5110 LCD display, to display the selected frequency, the signal strength, and a stereo icon if we are receiving stereo sound. The brains of the project are the small and inexpensive Arduino Nano. We can control the volume of the speaker using this potentiometer, and we can change the Radio frequency using this potentiometer. It is a fascinating project and relatively easy to build. Let’s see how to build it. The total cost of the project is around 15$. The Nokia 5110 is a basic graphic LCD screen which was originally intended for as a cell phone screen. It uses the PCD8544 controller which is a low power CMOS LCD controller/driver. Because of this, the display has an impressive power consumption. It uses only 0.4mA when it is on, but the backlight is disabled. It uses less than 0.06mA when in sleep mode! That's one of the reasons that make this display my favorite. The PCD8544 interfaces to microcontrollers through a serial bus interface. That makes the screen very easy to use with Arduino. You only need to connect 8 wires. I have prepared a detailed tutorial on how to use the Nokia 5110 LCD with Arduino. I have attached that video in this tutorial, it will provide useful information about the display, so I encourage you to watch it carefully. The cost of the display is around $4. The project is built around this FM radio module. The module uses the TEA5767 radio chip, this one here. The chip uses the I2C interface, so it is straightforward to use with Arduino. On the module, we can also find an audio amplifier. Unfortunately, this is a headphone amplifier so we cannot connect a speaker to the output of the module directly since the audio signal is very weak. We need to amplify it first. Also, there is no way to control the volume that comes out of the module with software, so we are going to use a potentiometer later on. On the module there are two headphone jacks, one is for the antenna, and the other one is the standard headphone output. The module comes with a small antenna, but you can easily build your own if you wish. Let’s now build the circuit according to this schematic diagram. First of all, let’s place all parts on the breadboard. We connect the ground pin of every part to the breadboard’s ground rail and the Vcc pin of every part to the breadboard’s positive rail except the Potentiometer which will control the volume. Now, let’s connect the radio module. The SLC pin goes to analog pin 5 of the Arduino Nano, and the SDA pin goes to analog pin 4. Now we connect the middle pin of the potentiometer to analog pin 0. With this potentiometer, we are going to select the frequency. Now we need to connect the Volume potentiometer to able to control the volume. I used an audio cable. I plugged in one end of the cable to the audio output of the module. Next, I cut the other end to find 4 wires inside the cable. The module outputs stereo sound, but we are going to use only one audio channel this time. So, I connect only two of the wires. One of them is GND, and the other one is the audio signal which needs to be amplified. The audio signal wire goes to the input pin of the volume potentiometer. The middle pin of the potentiometer is the audio signal that comes out. To amplify the audio signal, I use this module which uses the LM386 amplifier chip. The audio signal goes to this pin, the ground pin from the audio cable goes to this pin. Now, all we have to do is to provide power to the module. So we connect this pin the positive rail of the breadboard and this pin to the negative rail of the breadboard. The only thing that we have to do now is to connect a small speaker to the output of the module like this. With this small potentiometer, we can control the amplification of the signal. Now, all we have to do is connect the Nokia 5110 display. Please watch my detailed video on how to use the Nokia 5110 display to see how to connect it, or follow the schematic. The last step, which is optional is to connect a 330μF capacitor to the breadboard like this to reduce the noise on the audio signal. If we now power up the project, we can see that a splash screen is displayed for 3 seconds that and after that, we can hear sound from the speaker. The sound quality is not the best with this speaker and this audio amplifier. If I use another commercial speaker with an embedded amplifier, the sound quality is perfect. Check it out. So, the output signal from the module is perfect, but the amplifier and the speaker I used reduce the sound quality, so I need to search for better quality ones. Now that we have built the hardware let’s take a look at the software side of the project. In this project, we use two libraries. I am using the Nokia5110 graph library and a library for the TEA5767 FM chip. The code works like this. At first, we initialize the radio module and the display, and we display a splash screen for three seconds. I designed this splash screen in Photoshop. Watch the video tutorial I have attached if you want to know how to upload your graphics to a Nokia 5110 display. Next, in the loop function, we read the value from the potentiometer that controls the frequency every few milliseconds. We get the analog value from the potentiometer, and we map it to a frequency value. Since we read an analog value this value is not constant; it goes up or down slightly even if we do not turn the potentiometer. So to achieve a stable frequency, we only tune the radio to a different frequency if the frequency has changed considerably. So, if there is a significant shift in the frequency, we tune the radio module to that frequency, we get the signal strength, and we print it on the screen, we print the stereo icon if needed and lastly, we print the selected frequency. That is how the code works, it is simple but works ok. As always you can find the code of the project attached to this step. As you can see in about half an hour, we can build an FM Radio on a breadboard. How cool is that! The sound quality that we get out of this project is not great, yet. I am going to work more on this project to improve it in every field. I want to turn this project into complete radio with a retro 3D printed enclosure. First of all, I am going to try different audio amplifiers and speakers to get good audio quality out of this project. I will also move it away from the breadboard and make a permanent version of it on a prototyping board. I will also design an enclosure for this project to make it look like a radio. Of course, the code of the project needs a lot of improvements and tweaks as well. One feature I would like to add is a fine-tune functionality which will improve the sound quality even more. The project requires around 50mA of current when the backlight of the display is disabled. We can further reduce the current some software and hardware tricks so this project can be battery powered. I think, the result will be impressive, I cannot wait to see this project completed on my desk. This video was just the beginning. I would love to hear your opinion about this project. Do you find this project interesting? Also, what kind of improvements do you suggest? Do you have any tricks from your experience that can improve this project? Please post your comments in the comments section below and don’t forget to like the video and share it with your friends if you find it interesting! Thank you very much! My name is Nick Koumaris and I am a software engineer from Sparta, Greece. I love building projects and share them with the world!